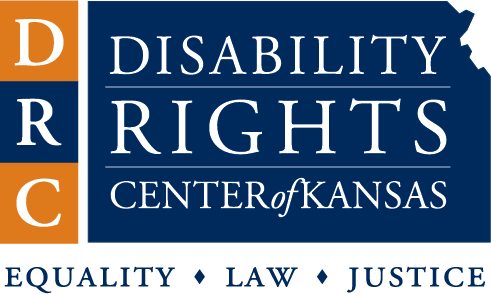 The Disability Rights Center of Kansas, a 501(c)3 public interest legal advocacy agency, has two open Advocate positions. Salary of each is approximately $15.38 per hour ($32K annualized), depending on experience. One Advocate position will work with Kansans with disabilities who are victims of crime and the other will work with all Kansans with disabilities. Both positions will advocate with and on behalf of Kansas clients with disabilities. Advocates will work under the direction of a licensed attorney, in order to provide effective legally-based advocacy services to Kansans with disabilities. Advocates help obtain justice and protect the rights of Kansans with disabilities. Excellent benefits - We pay 100% of the employee's individual health insurance premium at BCBS Kansas. We also have KPERS pension retirement program. We also provide access to cafeteria plan benefits (pre-tax health savings account, child care and additional defined contribution retirement). DRC offices are located in the Liberty Building at 214 SW 6th Ave, Topeka, KS 66603. We are on the first floor, Suite 100. If you click the Amazon logo on the SKIL website, SKIL will receive a donation from the program for your order. Thank you for your help and donations to SKIL programs and services. The Kansas Youth Leadership Forum for Students with Disabilities (KSYLF) is currently searching for motivated young leaders to attend the nineteenth annual forum held July 8-13, 2019 at Washburn University in Topeka. We are also searching for adults to serve as volunteers for the week of the KSYLF. The KSYLF is an annual conference that is heading into its nineteenth year serving students with disabilities across the state. During the forum, delegates enjoy a week full of learning, fun, friends, and, most of all, a new sense of empowerment! Through various large sessions, delegates are able to hear from community leaders on such topics as disability history, advocacy, goal setting, leadership, resources, and much more. Students are also able to share life experiences, goals, and ideas during breakout sessions with small groups. By week's end, all delegates will have stated their future plans and career goals in their very own Personal Leadership Plan. Aside from large and small group sessions, students participate in a variety of fun activities as well. A trip to the Capitol is always a highlight of the week. Students are able to tour the Capitol building, as well as participate in a legislative activity in the Senate Chambers. Other activities include a mentor luncheon where delegates are paired with an adult from their area who has a similar career interest, and a talent show where participants are able to share their unique abilities with the group. Other fun activities include a recreation session, real life fair, a barbecue, and a dance, which is always a delegate favorite! Have a disability as defined with the Americans With Disabilities Act. Be in the 11th or 12th grade as of December 31, 2018. Please note: Students who are in an 18-21 transition program qualify to apply as well. Have demonstrated leadership potential or interest in school and the community. Remember, leadership comes in many forms! There will be no cost for students who are selected to attend. All lodging, food, and accommodations are paid for through KSYLF funds. Accommodations such as personal care attendants, sign language interpreters, large print or Braille materials, and other accommodations will be provided for those delegates who need them. Students must fill out an application that will be reviewed through a competitive selection process. About 20 - 25 delegates will be selected to attend. The delegate application deadline for the 2019 Forum is December 15, 2018. KSYLF is also accepting applications for volunteers for our 2019 Forum. We are searching for committed, enthusiastic people who are willing to devote a week to this great program. Do you have the skills and passion to help facilitate groups and motivate youth with disabilities? Then consider serving as a volunteer at this year's KSYLF. Past volunteers, KSYLF alumni, and new volunteers are encouraged to apply! Volunteer applicants must fill out our application form, as well as two background checks, and send to the KYEA office. Volunteer applications are due by February 5, 2019. Many SKIL employees who use the Global Cash card have not gotten paid today. This is a problem happening with many companies who rely on Netspend/Global Cash all over the state of Kansas. Today no one has been paid and no one is getting a direct answer as to why. Netspend holds millions of dollars from many companies across the state. SKIL is far from the only one. Also, you can call the Texas State Attorney General's office (Netspend who controls these entities, is located in Texas). Their number is 1-800-621-0508. Global Cash/Netspend is holding millions of dollars of people's hard-earned money. We need to speak out and demand our money. The KS Disability Caucus, Inc. Board announces five Board positions up for election each beginning January 1, 2019 for a two year term. The Board wants to make sure that it represents the faces of Kansans with disabilities, therefore we need applicants from various parts of our population, such as race, ethnicity, disability, age, geographic, sexual orientation, and gender identification. We will review all applications from individuals wanting to join the group to organize and coordinate activities that promote independent living of all people with disabilities through collaboration, networking, education, planning, and peer-to-peer interaction, including the Caucus during even numbered years. We need individuals that are very committed to work hard in both planning and the hands on work needed to have a successful Caucus. We will contact you if you are chosen to join the Board or if we have more questions for you. In 1988, a small group of Kansans with disabilities came together to organize the first Kansas Disability Caucus when ninety people attended in Salina, KS. It was these united voices that helped to pass the first self directed personal care assistance program in Kansas. The Caucus has attracted many national presenters in independent living and disability rights through the years. There have been numerous purposes for holding the Caucus including education, advocacy, and planning. The KS Disability Caucus supports and encourages successful outcomes for people with all types of disabilities of all ages, especially encouraging the involvement of young adults. If you are interested in continuing these activities, please submit your application. The deadline for submission is October 31, 2018 at 11:59 p.m.